Who doesn’t want to save money on vacation, especially when the way you save money offers you a more luxurious vacation experience? 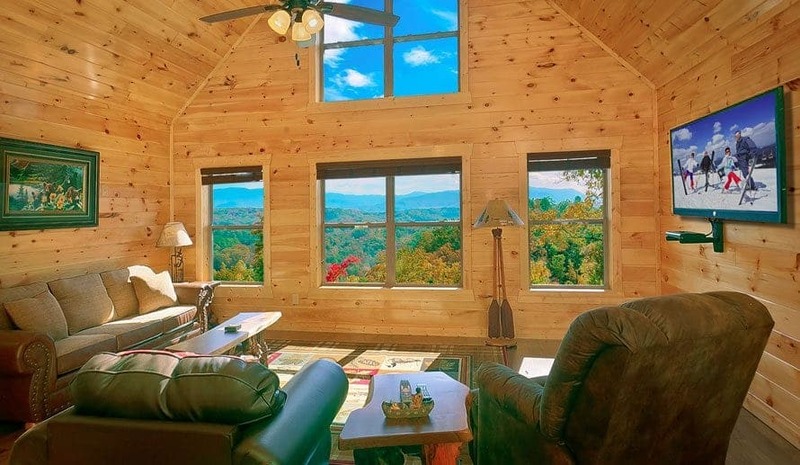 After doing a little research, we at Large Cabin Rentals are proud to reveal how vacationers who choose to rent a large Pigeon Forge cabin actually end up saving a ton of money over guests staying in a hotel. Not to mention, the visitors staying in a cabin also enjoy a better trip overall. When first looking at the cost of renting a large Pigeon Forge cabin rental compared to renting a hotel room, it may seem as if staying in a hotel is the cheaper option. However, once you factor in the number of people the cabin can sleep, the number of nights you plan on staying, and the added cost of eating out for every meal because you don’t have a kitchen, renting a cabin is actually a lot cheaper than renting a hotel room. You have to keep in mind most hotel rooms can only sleep up to 4 guests, and even then it can easily feel cramped. For larger groups, including family reunions, church groups and business retreats, this means you will have to rent multiple rooms to house everyone. This is how choosing to stay in a hotel can dramatically increase your vacation lodging cost. That being said, staying in a cabin help lower your cost per person because you can split the total among more guests. To help you better understand how renting a large Pigeon Forge cabin rental will save your family money on your next Smoky Mountain vacation, feel free to use our lodging rate calculator! This calculator will help you easily compare the cost of staying in a cabin to the cost of staying in a hotel during your trip. 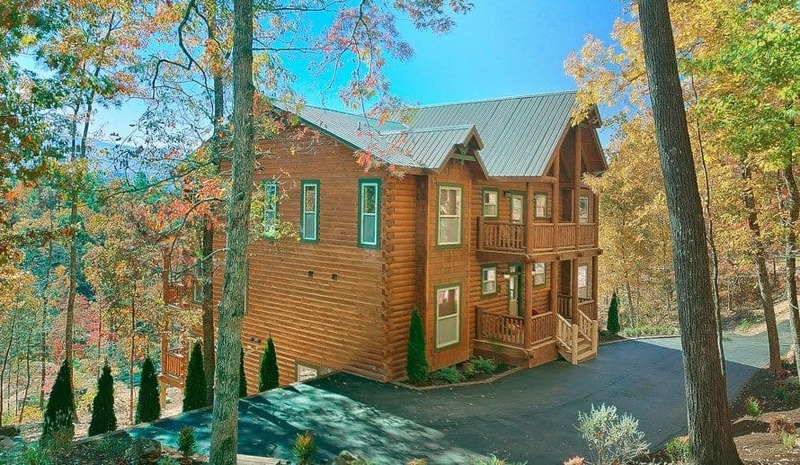 Click here to compare the cost of staying in a hotel vs. a Pigeon Forge cabin. Sure, it’s fun to stay in a hotel and be close to the action in downtown Gatlinburg or on the Pigeon Forge Parkway. However, being so close also means you and your family have to put up with all the noise and traffic that comes along with it. 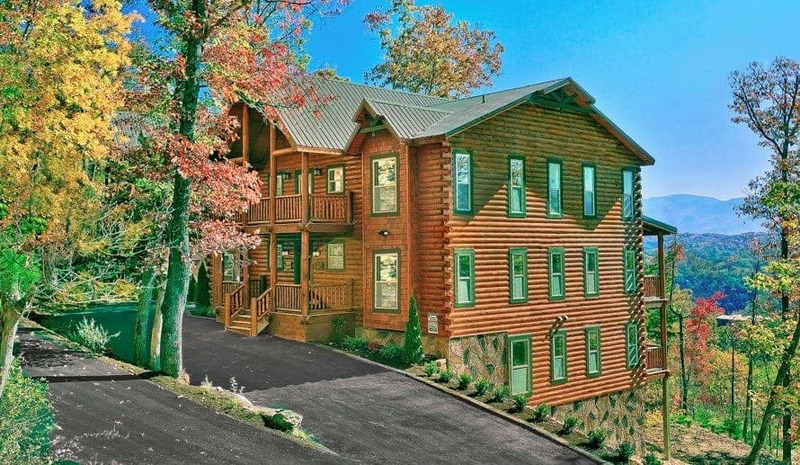 The perk of staying in a large Pigeon Forge cabin is you can still be close to all the excitement in the Smoky Mountains, but you are still far enough away that you can enjoy the peaceful serenity and sounds of nature at night. You and your family won’t have to be worried about being kept up late at night because of noisy cars driving by or strangers walking passed your hotel room’s door. 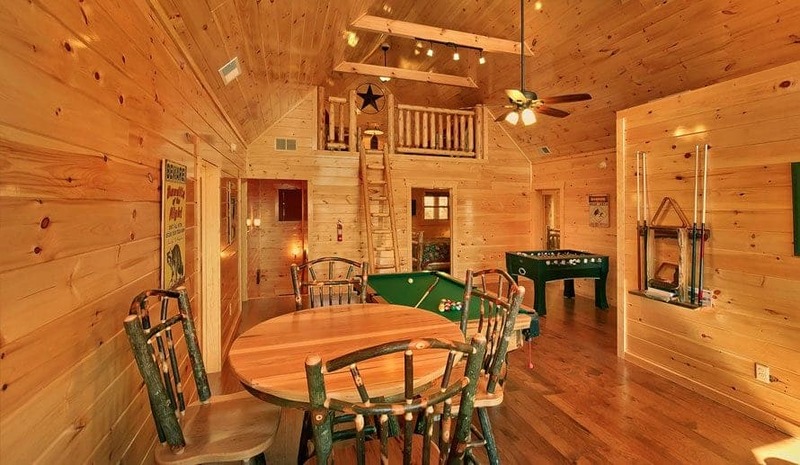 In addition to all added amenities choosing to stay in a large Pigeon Forge cabin brings to families and friends, the added space found inside these rentals is equally impressive. Typically when you choose to stay in a hotel room, you are confined to staying in a small, sometimes cramped, generic room. Hotel rooms don’t offer much space for guests to spread out, nor do they offer individual guests much privacy from their travel companions. However, cabins offer just the opposite. 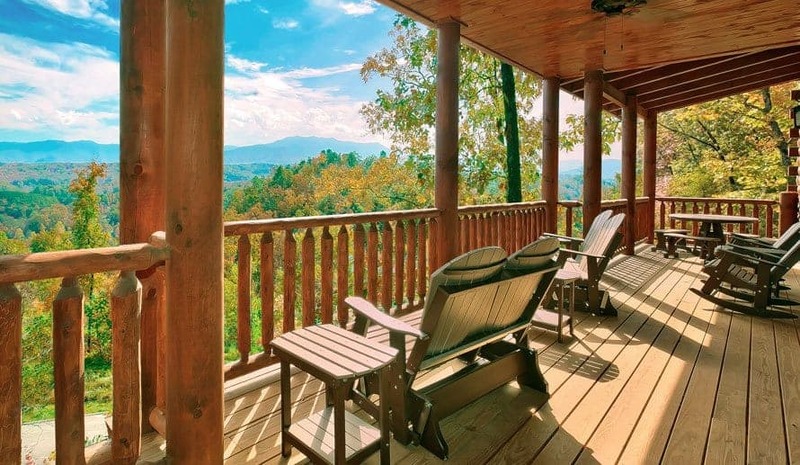 Because Smoky Mountain cabins are considered vacation homes, families and guests will find a ton of space to stretch out and relax in during their stay. Also, because these rentals offer their own private rooms, guests will enjoy an extra level of privacy inside a cabin that hotel rooms cannot offer. In a standard hotel room, guests can expect to find two queen beds, one bathroom, a tv, a desk, and one window with a limited view. If you choose to stay in a more deluxe hotel, your room may also include WiFi, a small refrigerator and a microwave. However, that is still not very luxurious when you compare these against the several amenities cabins offer guests. 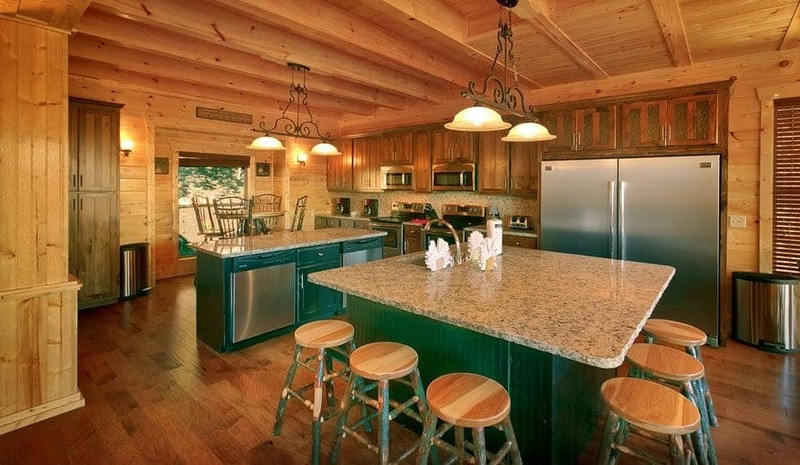 Inside a large Pigeon Forge cabin rental, guests can expect to find a fully-equipped kitchen, full bedrooms with private baths, cozy fireplace, outdoor hot tubs, game rooms, home theater systems, complimentary cable and WiFi, in-cabin laundry, ample living space and scenic mountain views. 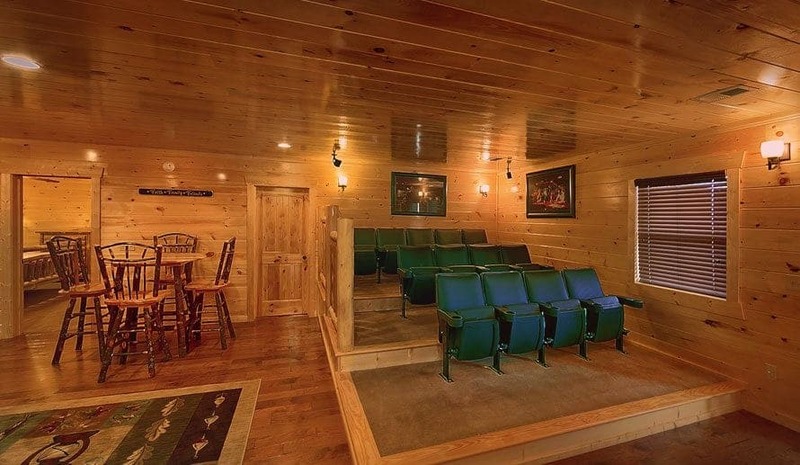 Some of the cabins offered by Large Cabin Rentals include even more luxurious amenities like an 18-hole mini golf course inside the cabin, a private outdoor barbeque area and an in-cabin movie theater. 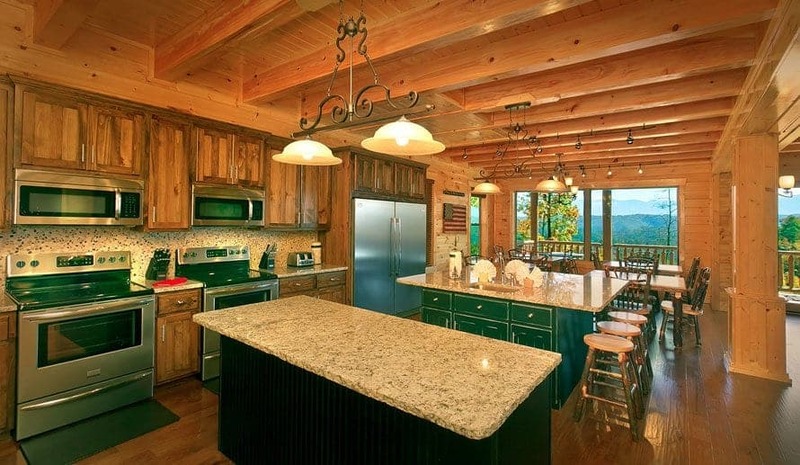 If you would like to learn more about how renting a large Pigeon Forge cabin can save you money, feel free to contact the experienced vacation specialists at Large Cabin Rentals today. You can either give us a call at the number above or you can fill out the Pigeon Forge cabin information form on our website. One of our team members will be more than happy to answer any and all questions you and your group may have.